Recognized expert in the theory and practice of data visualization. Noah Iliinsky strongly believes in the power of intentionally crafted communication. He has spent the last decade researching, writing, and speaking about best practices for designing visualizations, informed by his graduate work in user experience and interaction design. He is a frequent speaker in both industry and academic contexts. He has a master’s in Technical Communication from the University of Washington, and a bachelor’s in Physics from Reed College. 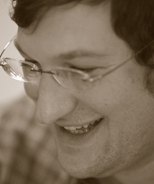 Noah Iliinsky is the co-author of Designing Data Visualizations, and technical editor of, and a contributor to, Beautiful Visualization, published By O'Reilly Media. This webcast will discuss data visualization. Learn linear processes and best practices so that your message may be transmitted without interference. "The layout of Beautiful Visualization makes navigation easy, with the chapter number, title, and page number all in the footer. Dont make it pretty, make it communicate a story about the data is the actuating tag line that Steele and Iliinsky succeed in sharing." "Includes some genuinely good ideas and is an entertaining read"
"Anyone working on a modern, data-intensive application will get a plethora of great ideas from this beautifully illustrated tome. "